Jalen Hurts accounted for 110 total yards and two touchdowns during his brilliant fourth quarter. Good luck selling this screenplay pitch to Hollywood executives. Heading into last year's College Football Playoff title game (vs. Georgia), Jalen Hurts was seemingly entrenched as Alabama's short- and long-term quarterback. But a rough first half led to Hurts' benching, thus paving the way for Tua Tagovailoa to engineer an epic second-half comeback (claiming the national championship) and become the Next Big Thing in college football. 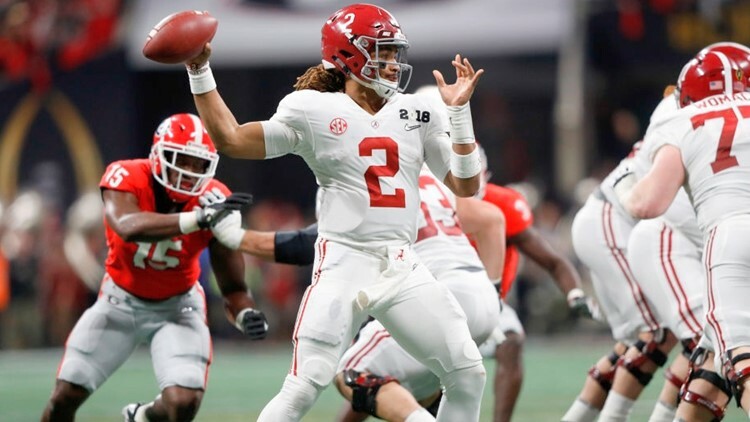 For Saturday's superb SEC title game, Hurts subbed in for the injured Tagovailoa and rallied the top-ranked Crimson Tide to a 35-28 victory at Mercedes-Benz Stadium. For that brilliant fourth quarter, Hurts led three scoring drives and accounted for 110 total yards (82 passing) and two TDs–including the game-winning keeper/scramble (15 yards) with 1:04 left on the clock. It was an amazing performance by Hurts, who had been the star subject of SEC Media Days back in August, with seemingly every media pundit speculating on whether Hurts would transfer from Alabama, once Tagovailoa had become the Tide's official starter. But Hurts kept a cool head and patiently waited his turn, while serving the backup role for 12-plus games. But everything changed Saturday ... on the very same field where Hurts lost his grip on the starter's job back in January. **Hitting Jerry Jeudy with a 10-yard scoring pass, knotting the score at 28. **Evading an oncoming rush of Georgia defenders in the final minute and then sprinting for the SEC title-clinching touchdown. From the UGA perspective, this loss might be even more gut-wrenching than last year's title shot with the Crimson Tide. The Bulldogs (11-2 overall) produced two-touchdown leads on multiple occasions, and the UGA defense was rather prolific in forcing anxious moments in the Alabama red zone. **The Crimson Tide's opening possession went deep into UGA territory ... but ended with a Richard LeCounte interception near the goal line. While standing just a few yards from the end zone, Jacobs mistakenly reached for the goal line too soon and subsequently fumbled the ball before either knee touched the ground. Quickly noting his gaffe, Jacobs took possession of the loose ball for a very-brief second ... but the stealth move was deemed long enough by Instant Replay officials, rendering Jacobs' second fumble on the play moot, since he had the ball passed the goal line. The postmortem revelation: If Georgia gets that touchback call ... the Dawgs might have cruised to victory in the second half. Instead, Jacobs' heads-up play became the turning point for Alabama's crazy comeback effort. **In the third quarter, Tagovailoa marched the Crimson Tide into point-blank scoring range ... and once again, he squandered a chance to cut into Georgia's consistently strong lead. Defensive back J.R. Reed played the hero role this time for UGA, swooping in at the last second for a goal-line interception. At the time, no one could have guessed that Alabama was on the brink of an astounding reversal of fortune. Nobody's perfect, of course, but it's hard to explain Rodrigo Blankenship's 30-yard missed field in the third quarter. A Blankenship make would have boosted Georgia's lead to 31-14. It would have also forced Alabama to be more desperate on offense, knowing the Tide would need three scores to catch the Dawgs. Sensing the gift from the football gods, they were able to remain patient and stick to the plan of attacking the middle of UGA's two-deep zone defense. And that's what happened a few minutes later. With Tagovailoa in the lineup, his short pass to Jaylen Waddle eventually became a 51-yard touchdown reception, cutting UGA's lead in half. How did Waddle shake free from the omnipresent Georgia defense? We can answer this in three simple words. World ............... Class .................. Speed. With Georgia on the brink of a go-ahead score with 3:04 remaining, Jake Fromm (301 yards passing, 3 TDs) had quickly furthered the troops with a well-executed swing pass to D'Andre Swift, with the tailback rolling for 26 crucial yards. Through most observers, Georgia might have required just one more first down to get into adequate Blankenship territory. But somehow, the Alabama defense recovered on the fly, forcing one last UGA punt attempt. On the fourth down, UGA head coach Kirby Smart OK'd a fake punt call, apparently demanding that backup quarterback Justin Fields retrieve the ball and somehow roam for 11 yards. The Alabama defense, which had been in 'Safe Punt' mode, according to head coach Nick Saban, had little trouble stopping the curious call, limiting Fields to two measly yards. For Georgia's two losses this season (LSU, Alabama), poorly timed fakes (either field goal or punt) killed the Dawgs' momentum both times. Damn the coaches and players' luck on ill-advised calls.